Viaualization and larger size is the trend in the signage industry. The new large format size printer, JV5, is the key. Industry: Overall color printing, photo shoot, processing and finishing, digital image processing, the sales of photo-related products, creation and processing of indoor and outdoor signage, substitute in planning and advertising, creation of brochure, etc. Installed printer: Solvent inkjet printer JV3-130 and JV3-250, JV5-160 and JV5-320, Cutting plotter CG-130FX, Water-based inkjet printers. Loyal color is establised in 1964. They focused on the possibility of the demand expansion of color picture and the industry of leisure and information. By introucing excellent technology and machine of Kodak, they started processing laboratory specializing in Kodak's color film. Since their foundation, they steadily expanded their sales channel, and now they are the leading company which has business base around Kanto and Koshinetsu area (The middle part of Japan). Now, their market is divided into two categories. One is the "Consumer market", targeting at the amature photographer which accounts for 60% of the whole market. The other is the "Professional market", targeting at the commercial pictures which account for 40% of the market. 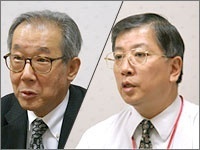 They started digitalization business in 1991. Before that time, they had been created the manuscript by masking the illustration, picture, and letters into the negative, but they introduced Kodak's Premier which digitally output the data on the negative. The operation by the combination of the analog and digital changed into DTP by Macintosh, and the manual operation such as masking is replaced with the digital method by computer. "Our industry can be divided into 3 area: Development Laboratory; Dupe Laboratory; Print Laboratory. With advent of the digital camera, development and dupe are already digitalized. 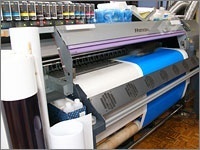 While our business is what is called Print Laboratory, everything will be digitalized except for the installation. We feel that the wave of the digitalization in photo industry came earlier than expected." The base of "Commercial Imaging department" is the Professional Laboratory which take care of the commercial picture. In the recent years, the Professional Laboratory was extended, and became to deal with Sign & Display business such as the window display of the department store. Four years ago, the company introduced another JV3 just after they purchased JV3. Last year, they introduced JV5 with the width of 1600mm. At the same time, they procured two cutting plotters of CG-130FX, and they actively undertake the creation of the booth for the exhibition. "The print speed and the image quality of JV3 is satisfying, and its affordable price was attractive. The only problem was the odor which is unique to the solvent ink. The working environment became worse. When we were thinking about the solution, the odorless ink, SS2 ink, was developed. We had been using the overseas printers, but everytime a new system was developed, the system was not compatible to the conventional printers. 'Please abandon the old printer, and buy a new one.' This was their way of sales. However, Mimaki was different. The newly developed ink was loadable to the conventional machines without any modification. This user-oriented attitude is special to Mimaki we think." Their Sign & Display business can be classified into the indoor (store) decoration and the outdoor signage. Mainly, for the indoor decoration, they use printers other than Mimaki. For the outdoor signage, they use Mimaki's JV3 and JV5. Mr. Takahashi who is the Assistant Manager of the production section talked about the current signage industry as follows. "In 1998, after Nagano Olympics, the signage in Japan became visualized using pictures, and also became larger than ever. These days, the order of the wrapping of the bus or the building is increased." 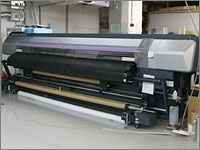 In summer of 2007, they introduced the grand format inkjet printer, JV5-320S, right after it was launched. The large-sized machine with the high image quality and the fast print speed is in full operation, and now JV5 is vital to them. In spite of the large printer, the print speed is really fast. For example, it takes three hours to print 12 square meter by JV3-250, JV5-320S finish printing in 30 minutes. If we think that the "Speed = Cost", the time cost cannot be compared to JV3-250. Since the image quality is fine, the large signage, which is seen close such as advertisement set at the concourse, can be printed by JV5-320S. Mr. Yoshida closed this interview as follows. "The performance of the printer improves quickly, and the needs of the client becomes the more diversified. In this age, one can lose jobs who thinks 'If we wait a little more, the more better machine will be launched.' No matter how the equipment investiment is a little bit high, we should intorduced the state-of-art technology so that we can win business. We believe that the looking beyond the present and predicting the future trend is the key to survive in the signage industry." IndustryOverall color printing, photo shoot, processing and finishing, digital image processing, the sales of photo-related products, creation and processing of indoor and outdoor signage, substitute in planning and advertising, creation of brochure, etc.